This year all spiritual pilgrims wishing to experience the enlightened teachings and empowerments of the Buddha can participate in a unique Kalachakra Ritual during The Kalachakra Festival in Leh, 2014. This festival in Ladakh offers a complete, complex and esoteric teaching of Tibetan Buddhism practice that can be incorporated into one’s daily life. During this special event, the Kalachakra teachings and the Kalachakra Ritual will be offered with great compassion to a large audience, most of whom are interested in freeing themselves from the sufferings of cyclical existence. It is truly a rare chance to participate in one of the great spiritual festivals in Ladakh, which is known for its skillful methods and teachings geared at liberating an individuals mind for the benefit of all. 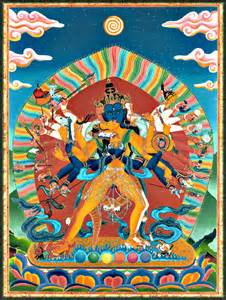 The Kalachakra teachings and practices connote a specific cycle of time, namely external, internal and alternative. The external and internal aspects of the teachings and practices deal with relative time, and the alternative aspect deals with the path leading to liberation from relative existence. In essence, the Kalachakra Ritual and teachings revolve around the laws that govern both the microcosm that dwells within us and the macrocosm of our immediate surroundings, as well as the entire universe. The Kalachakra Ritual is tailor-made for “busy people”, and gives them practical tools to deal with these governing laws in such a way that results in lasting happiness and peace in this very life. It is said that a king once asked the Buddha to teach him how to practice the “Dhamma” without having to renounce his kingdom and worldly life. So the Buddha, with unlimited compassion, expounded the root Kalachakra Tantra which provided practical methods on how to apply its teachings so that worldly people (i.e., non-monastics and yogis), could advance towards Buddhahood while still living in the world. By practicing the Kalachakra teachings and methods propounded by the Buddha, the king was able to continue on with his responsibilities towards family and society while simultaneously liberating his mind from past negative impressions and promoting positive new ones. For many years the Kalachakra teachings and practices were guarded safely from student to disciple in India until they were codified and spread throughout Tibet. There they were put into practice by loyal lay, monastic and yogi Buddhists with great success. The Kalachakra in Leh, 2014 will take place at the “Peace Garden” – the original summer home of the Dalai Lama. It is approximately 8 kilometers from Leh, and is the first place where His Holiness, the XIV Dalai Lama, resided during his initial exile in 1959. This auspicious event covers a huge area (roughly 37.5 acres – 150,503 square meters), and can accommodate approximately 150,00 participants. The Kalachakra Festival begins on July 3, 2014 and ends on July 14, 2014. As was stated earlier, the actual teachings, empowerment and practices will be held throughout these days along with ritual dances, chanting and prayers. CULTURAL TOURS OF INDIA BRINGS YOU CLOSER TO ITS MAGNIFICENT HERITAGE Experience the awakening you seek with Atithi Voyages!